Dates and Events may vary slightly from posted information. Missed an episode? You can watch it online at at ABC.com . Teresa Castillo, Kristen Storms and their gorgeous babies! Why Alexis can't quit the habit! Tyler Christopher as "Saint Nikolas". Looks he is playing Santa at the GH children's X-mas party. Kirsten Storms on the GH set with her perfect, real-life, little girl! Nathan is caught between Maxie and Annie (Donely. See our Rumorville item of June 5th for more). Nik gets an eyeful of Kailey, who will remind him of Katherine Bell. Carlivati explains that Franco and Nina, "are two people who can possibly relate to each other due to their questionable grip on reality, their mental issues. There's more to come there, definitely." According to Lisa LoCicero in SOD, Olivia is not quite ready for a new romance yet, but Olivia, "takes one look at Ned and how could you not see the amazing potential there?" Carlivati, Will following leads bring Sabrina, Patrick and Sam, "back to Robin and Jason and what went on at", the clinic? Bryan Craig (Morgan) believes that Ava's son will be his. He and Rosalie are becoming closer in a real sense, but what would Ava's baby mean for their relationship, never mind Nina's plotting? Michael's entire world is ripped apart as he learns of Sonny, Carly, Kiki and Morgan's betrayal. It will have a huge impact on his character for a long time to come. Look for a big character shift, this experience will change him completely. Even though Jason will be living at Liz's after being hurriedly discharged from the hospital, Sam will continue to be thrown into his orbit. Sam and Patrick continue their investigation into the accident and Luke. With Tony Geary returning, look for the truth about Fluke to begin to unfold. Nina and Franco's friendship will remain a focus. Maxie and Nathan continue to deal with the issue of Judge Walters impeding their relationship. The connection between the pair will deepen. It will be interesting how Alexis and Julian deal with the obstacles coming their way. There is still potential for more than friendship between Ned and Olivia. Jason Thompson (Patrick) shares/speculates that before the truth comes out that Jake is Jason, he would like to see a friendship develop between the two men. He talks a bit about the possibility of becoming Jason's doctor, and if he does, would that clue him in to his identity? He ponders about how would Sam react. Head writer, Ron Carlivati, says he is keeping some hope for Silas and Sam alive...for now (November sweeps), but she is also becoming closer to Patrick. Jordan's real role may be revealed to the citizens of Port Charles soon. Jake and Liz continue to bond. Julian vows to do whatever it takes to protect Alexis. Sonny's latest piece of knowledge could endanger others. Franco looks into Dr. Obrecht. Will what he learns impact his next plan of action? Regarding telling TJ the truth about his father, Vinessa Antoine (Jordan ) , "I'm looking forward to it coming out. It's an interesting secret...and it's definitely going to change some things! I was told what it was before I read it in the script, but I kind of figured it out. I thought it was something way different in the beginning, but now, I get what they were doing. Things are pretty messy for her. Shawn and TJ both still think she's working for the Jeromes, and then it's a whole other thing that she's DEA and involved with Shawn!" Ron Carlivati, headwriter, agrees, "There is a lot still to play out with this storyline. The secret is only one part of things." Madeline is expected to return further down the road. Needless to say, she has an agenda. Johnny Z wants in on Sonny's territory. Looks like Carlos is now working for...Johnny? Ava is arrested for the murder of Connie. Sam is furious that the man behind the ski mask saved the man who shot Jason (Faison). Despite the danger, Sam decides to investigate who is behind the shooting. She has a hunch that Jake was involved. Helena interrupts Sam and Jake. Sam sets out to find out what happened at Crichton Clark (regarding Jason). Ned and Olivia grow closer. Maxie learns the verdict of her custody hearing. Tensions run high among Olivia, Ned and Alexis. Jake confronts Sam about her suspicions. Shawn and Duke team up to protect Sonny. Dr. Obrecht reveals to Nathan the real reason she stayed behind. Julian is surprised by Carlos' reveal. Julian and Sonny may have an opportunity to change their fates. Ava's baby undergoes testing (paternity). Carly faces down Franco (again). 12/16 Maxie learns the result of her custody hearing. After an honest conversation with Spencer, Nik and Spencer receive a surprise visitor. After more awkwardness, Olivia finally decides to come clean with Ned about her feelings for him. Dr. Obrecht shares a secret with Nathan. 12/17 Patrick seeks forgiveness from Sam. Ava receives an apology from Sabrina (for the pills, trying to make her lose her baby). Jake has questions for Sam. Sonny brings Shawn up to date and gives instructions. Michael takes a ruthless action. 12/18 Sam receives a warning from Liz. Franco pleads with Nina not to give up on him. Duke and Shawn team up. Julian is shocked by developments in the mobular world. 12/19 What will happen to Nina and Franco as a result of their actions? Jordan is confronted by Shawn. Morgan receives support from Kiki after he receives some upsetting news. Maxie receives a promising bit of information (the tables are turned?). Jordan decides she wants to remain undercover. Shawn pressures Jordan for more info on the Jerome family and their future plans. It looks like Jordan's cover is in serious jeopardy. The results of the paternity test on Ava's baby are revealed. Sonny has no choice but to accept Johnny's terms in order to gain Ric Lansing's release. Shawn and Duke form a pact to try to protect Sonny's business. Carlos informs Julian that he is working for Johnny. Julian is stunned by Johnny Z's power over Sonny. Sam shows Dante enhanced footage of the man who took her hostage the evening Faison escaped. After Liz informs Jake of Sam's suspicions, Jake decides to confront Sam. Sam begins to wonder about Liz's motivations. Jake confides in Patrick that he is troubled by some of his own recent actions and gaps in time he cannot account for. Patrick advices him to seek therapy. Nina and Ava get into it, as Carly gets verbal with Franco. Julian attempts to mend fences with Sam. Dr. Obrecht does something kind for Nathan. Dr. Obrecht shares a bit of confidential information with Nathan. Pentonville is becoming crowded with familiar faces...but for how long? Alexis is once again interrupted from telling Molly that Ric is alive, by an unexpected visitor. Fluke informs Julian that Luke is still a captive; and he has a job for Julian. Julian will work to gain Johnny's freedom from Pentonville. Needless to say, Helena will not take kindly to Sam's digging around; Alexis may need to watch her back as well. Will Carly be able to deny her love for Sonny, to Michael? And is that how she would want to mend her relationship with her son...with another lie? Not only does Duke feel comfortable with his position in Sonny's organization, there is a part of him that is challenging Anna. Head writer Carlivati, in SID explains it as, "We're going to be part of each others' lives, whether you like it or not", even if it means they are on opposite sides. It seems he is thinking, "what better way to keep the top cop around" him than be all bad boy? Will Ava end up locked away for decades for Connie's murder? Carlivati, "she's a pretty resourceful lady." And let us not forget Silas. "They had a pretty passionate relationship in the past...we will see there is a part of him that still cares for her...his instinct is to protect her." Carlivati admits that although Ned is the "safe" choice for Alexis--at least to her way of thinking-- the two as a couple lack the heat she shares with of Julian. Looks like there is much more to come for the latter. On Franco and Nina, Carlivati is interested in seeing how this couple of crazies deal with the obstacles in front of them. Are they falling in love? Are they capable of love? Carlivati, "They could be each other's salvation...or they could be each other's destruction." Sam continues to come after the man she believes held her hostage, Jake. Meanwhile, Jake is tormented by secrets he cannot remember. Will he be able to break Helena's hold over him? Sam is able to forgive Patrick and there are real feelings there, but everything is turned upside down once the true identity of Jake is revealed. How will Shawn react when he learns, "the secret--or maybe secrets--that Jordan has been keeping from him"? Carlivati also promises that the guessing games for viewers regarding Fluke will come to an end (guessing this will most likely happen towards or during February Sweeps). 12/22 Jordan receives a warning from Carlos. Alexis is surprised by an unexpected visitor. 12/23 Dr. Obrecht does a good deed, who benefits from her act of kindness? 12/26 Fates conspire to keep this couple apart. Liz gets asked out on a date. The tradition of the Chief of Staff reading the Christmas story continues...with Dr. Obrecht. Hmmmm.... no doubt her style of holiday spirit will rattle a few cages. Will Ric be reunited with Molly in time for Christmas? And if so, how will his reappearance impact Liz's growing relationship with Jake? There seems to be no doubt that Ric would like to pick up where he left off with Liz. Nathan may feel sightly threatened by Spinelli. Jake is jealous over Liz being asked out for New Year's Eve (looks like by Ric). Jake gets an earful about Ric from Carly. Liz wants to give Ric a chance, but Jake is not so sure she should. Molly confides some news in TJ. Judge Walters and Monica become closer. Lucy and Duke have an honest conversation. Duke is told by Shawn that Jordan is hiding something. Spencer receives a warning from Nikolas. 12/29 Patrick asks Sam to spend New Year's Eve with him. Anna tries to talk Jordan into doing something Jordan would rather not do. Jordan finds herself in a precarious position. 12/30 PC citizens gather to celebrate the New Year, but are they all with the ones they love? 1/02 Who will be bumping lips as the New Year rings in? Alexis makes a deliberate move guaranteed to bring on Julian's jealousy. Live Recaps as the show airs are available on our Homepage! Robin Mattison (Heather) tapes again on Dec. 18th. It seems she will interact with mainly with Nina (and perhaps others). Donna Mills (Madeline) taped again on Dec. 17th. It looks like she will appear with Ava (and possibly Ava's baby and Kiki). On December 15th, Kimberly McCullough tweeted, "Guess where I was today? Hint: I got to meet the talented, super handsome Billy Miller". It seems that Ric Lansing has already been lurking (although thus far unseen) in Port Charles. "Jake" decides that the best thing for everyone would be for him to move out of Liz's home. It looks like he will live above Kelly's, while working as a handyman (most likely for Carly, at the Metro Court). Will mistletoe bring out a few kisses? Crispin Alapag is appearing on GH in the recurring role of, "Heavy". Crispin shares that, "Working with such great talent and cast has been an honor and a pleasure." Another actress (not Sada) by the name of Monica Lawson is taping scenes the same day as well. Looks like this fella, Andy Martinez Jr., will be making an appearance on GH, around January 13th. Drinks and commiseration over despair and what seems to be lost opportunities may lead to an unexpected one-night-stand between two unlikely people on New Year's Eve. It never hurts to review our older spoilers in this section, below. Julian will end up in Pentonville with Sonny. Now THAT should be interesting! What do Nathan and Dante want with Johnny Z, or vice-versa? There is more to come regarding Nathan's paternity, further down the road. Helena manipulates Jason. He will have a strong reaction to learning about his identity, one he cannot remember. Ironically, after Sam confides in him, "Jake" is the one who convinces Sam to forgive Patrick for keeping the secret (Robin trying to revive Jason) from her. 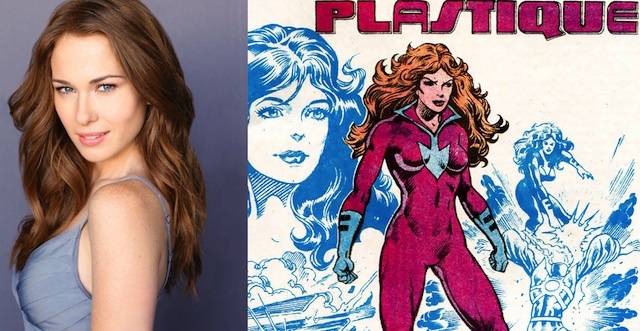 Nikolas (Tyler Christopher) recently taped a few scenes with a character going by the name of "Ivy", played by Kelly Frye, who recently appeared in an episode of The Flash, as the supervillainess Plastique. Bradford Anderson (Spinelli) is taping on November 20th with Maxie and Nathan. Expect a lot of twists and turns in the, "Who is Fluke? ", storyline. There will be revelations coming soon but not all at once. What we have seen up until now is just the prologue. Don't expect a reconciliation between Duke and Anna any time soon. An actor by the name of Miguel Nájera has been taping some scenes involving Carlos (and possibly Julian). After Julian's confession, Alexis tries to dig into Fluke's identity but this could make her a target. Sonny's claustrophobia while imprisoned will again be an issue. Betsy Franco (James Franco's real life mother), Franco's adoptive mother, is also making another appearance. She will have scenes with Delia, Kiki, Morgan, Silas and Ava. Ava's mother Delia (Ilene Kristen) is making another appearance. Constance Towers (Helena) has been busy taping and she won't be nearly as isolated as she was in her most recent appearances. This time, she appears with a wide variety of characters across the Port Charles canvas. UPDATE: Barash began taping on Nov. 11th, in scenes with Sonny. Maxie may get to see Georgie before years end; word is that Spinelli (Bradford Anderson) brings her by for the holidays (most likely Christmas). What will he think when he meets "Jake"? Marc Anthony Samuel (Felix) has been placed on recurring status. Oldtimers should keep in mind how "Lord" Ashton first arrived in town, re: the "Dragon Bone" storyline, his history with Tracy, his fortune-seeking motivations, the "key" to secrets, and his later involvement with The Cartel (which included Harlan Barrett, Leopold Taub -both deceased, Paul Hornsby was involved to an extent, and Cesar Faison. Bill Eckert had an involvement as well, although at the time, it was unwillingly). Kelly Thiebaud's (Britt) status with GH has changed. She is no longer on contract, now recurring. She is expected to make an eventual exit. Robb Derringer (the actor mentioned twice below) is playing Special Agent Kyle Sloane. Beginning in November, Jason experiences bits and pieces of memory flashbacks, some of them disturbing. Will he begin to have doubts about the kind of person he once was? In a recent interview with Finola Hughes (Anna Devane), Michael Fairman wonders how Finola feels about Anna possibly having competition for Duke from Lucy, Finola, "Oh, I think you got to shake it up. I love Lynn [Herring, who plays Lucy]. So, the opportunity to perform some silly scenes with her is really going to be a plus. I have known Lynn forever, so it’s going to be fun." Does Anna truly believe Robin is [in Paris and] not in any danger right now? Finola, " I actually shot something the other week that just might verbalize what Anna is thinking." Will Anna be busy in November Sweeps with all the crazies out in Port Charles? Finola, "I think I come in on the tail end of it, sweeping up the sweeps … sweeping up the tail end of November Sweeps. (Laughs)". Anna finds out herself out of favor with the person now overseeing the operations of the WSB. The actor mentioned further below, Robb Derringer, could be that person. Patrick finally comes clean to Sam about Robin's attempt to revive Jason, and that he is now dead, after a confrontation between Sam and Faison. Sam's anger at Patrick will not last long. In case you missed it, Ryan Paevey (Nathan) interviewed some of his co-workers on "EXTRA" recently. You can watch it HERE. As previously rumored, Julian will have to go into hiding for a while. Fluke takes an action that terrifies him, and Ric's return could be involved. An interview with Donna Mills (Madeline) that some may enjoy HERE (video). Anders Hove (Faison) is back taping scenes starting Oct. 14th. It looks like he will be interacting (at least initially) with several different people (Helena, Dr. Obrecht, Jason, Sam, Nikolas, Britt, and an actor by the name of Robb Derringer) . Update: Derringer is Agent Sloane. Follow the money...to Barrett Enterprises and all things B.E..
Carly offers to help Jason find a job when he gets the all clear. It will be months before Jason remembers who he is, but in the meantime, he will feel instinctive connections towards certain people from his past. He may be told who he is long before he has any solid memory of it (just flashes). Anna and Patrick get a hint that Robin may not be in Paris. Further down the road, Helena sends Robin back to Port Charles on a mission. When Robin returns, the truth will come out about Jason being alive (and likely having made it to Port Charles), but it will still be a little while after that before it is realized that Jake is Jason. Jason and Liz are going to get much closer (but will it last?). Britt and Nikolas are together now, but the truth will spell eventual doom for their relationship. A surprising man comes to the aid of an equally surprising man. Fluke is determined to take advantage and move in on Sonny's territory. Helena's plans for Jason and Robin are far from over (should begin sometime in late November). SID has confirmed that Hugo Napier (Lawrence Ashton, Tracy's ex, father of Ned) is heading back to General Hospital for a bit. If things continue as planned expect other returns, one female, one male (possibly two), which relate to the previous hints given on this site in the past (News page, Rumorville, etc) as to the identity of Fluke. The initials B.E. may have more than one meaning. Stay tuned. Maxie will finally get the opportunity to visit with Georgie. Just as Alexis and Julian seem closer than ever....Ric returns (more on this in previous Rumorville item). Will Jerry (Sebastian Roche) follow Helena's orders or will he work with another against her plans? Looks like he will eventually work against both Helena and Fluke. Much further down the road, Robin finds herself in a seemingly inescapable situation, in a familiar place to viewers, along with another familiar face (Tony Geary). Robin and Luke may have to work together to save themselves. Sabrina's current story line is the "long good bye" to the character's exit. Kimberly McCullough (Robin) will tape again later this year, for a longer period of time. For down the road...keep in mind that Helena appears to have rescued Stavros' and Lulu's embryo, and has taken a deep interest in Jason. Don't count Victor Cassadine out yet. It is likely that he will reappear in early 2015. Anna is determined to take Julian down, says Carlivati, "she has a blind spot" as far as he is concerned. However, with rampant crime going on right now she has her hands full. Olivia has been saying she is not ready for romance, but "somebody else is going to come into the story" that may have her thinking she should "have grabbed" Ned when she "had the chance". What will happen when TJ eventually learns that his mom is really one of the good guys, AND the big secret Shawn and Jordan have been keeping regarding his father? Patrick and Sam continue to bond. Head writer, Ron Carlivati, in SID says, "We want the biggest impact possible should Jason come back to the canvas." Alexis tries to resist her pull towards Julian. Their reconnecting could be a dangerous proposition for both. Will Julian try to form an alliance to rid himself of Fluke for good? Jordan continues to be conflicted, she wants to tell Shawn about her undercover work and not doing so is becoming more and more difficult. Lives are endangered as Sabrina continues her quest for answers. Sabrina's investigation ties several storylines together. There are hints that the Nathan/Dante/Levi/Lulu/Maxie story will eventually tie into the characters involved with the clinic storyline. Tyler Christopher informs fans he has plans for his four months off "this upcoming year" (presumably he is referring to 2015). He tweeted, "We just have 4 months off a year collectively and I'm using that time to travel [with his family]." UPDATE: Head writer Ron Calivati tweeted: Not 4 months in a row! He's talking about dark weeks and vacations! Has zero effect on his airtime! Tony Geary's (Luke/Fluke) slow recovery from back surgery. This delays Ric's return as well. However, once Geary returns, Rick Hearst (Ric) will be seen not long after. Expected first on air appearance for Geary is around November Sweeps. Spencer has an "imaginary" friend (this should be Kailey, a young Cassadine). (Update: We may not see Kailey until this winter..). As mentioned further below, Patrick will become Nina's doctor. Why? Possibly to repair brain damage. (Guess this will be an attempt to "redeem" her somewhat, and as also mentioned before- to add to the "mirror" of the Patrick/Robin storylines). Although Patrick and Sam are becoming closer, let us not forget that Patrick is keeping a big secret from Sam (Robin/Jason). Jason Thompson (Patrick) is now engaged! He shared the happy news via instagram. In a recent online interview, Michelle Stafford described her character, Nina, is now psychotic, a definite sociopath. When Jason returns to Port Charles (most likely in the fall), look for a battle for his very soul- Quartermaine vs Morgan- with Monica on one side vs Carly/Sam on the other, and plenty of other characters/villains and complications. For more info, see THIS previous Rumorville item. Annie Donely, Anna Devane, and Nathan may have something in common, professionally speaking. Fake Luke has a female partner and she has a history with him. Ric will blame Julian (and fake Luke?) for ruining his chances with Liz, and for having to play dead. Will he be looking for payback? There is a reason that old Blast From The Past video interview was posted on our GH News page (on June 1st). Carlos is horrified and angered about Gabriel's death and wants vengeance. Dr. Obrecht doesn't want Helena to know she disobeyed her orders and that Katarina/Kailey is alive. Kailey's real, or formal given name, appears to be Katarina Stephens (nice combo name of Katherine Bell and Stefan Cassadine!). When Ric returns, Liz may gain a stalker. Carlos will be plotting for payback and revenge. We will learn more about Dr. Obrecht's past. Carlivati hints it will soften her character a bit. Expect to learn more about the secret between Shawn and Jordan. Julian still wants a future with Alexis, but how can he do that with Fluke still in charge? Carlos may not be behind bars all that long. Patrick will be treating Nina (mirrors Robin treating Jason....part of a larger umbrella story). Down the road, we may learn that Jerry Jacks (Sebastian Roche) knows why Jason was saved. Liz's confession of love, despite Nikolas' initial reaction, will have an effect over time. In a recent SOD interview, Tyler Christopher hints that they are trying re-introduce the idea that the only reason his character, Nikolas, betrayed his brother with Liz was because Nik was, "truly in love, completely head over heels in love with Elizabeth..." And now, "How does he differentiate between his love for Britt and his love for Elizabeth?...That's the story moving forward." Rebecca Herbst adds, "I think Tyler has the right idea [that the two] characters really do love each other." Herbst hopes that fans will be pleased to see the relationship resurrected. Spumors: Some suggestions that Sam and Carly will be made aware (at least at some point) that Robin left Port Charles in an attempt to save Jason. Nevertheless, it is said by some, it seems that Sam does not want to bet her own future on it. .